Marin families have another great resource to help them in their busy day-to-day with MaidPro house cleaning service. Started in Marin in 2016 by mom-to-be Cambria Terheyden and her husband Sean (both former Marin County teachers), MaidPro offers dependable and detail-oriented services to the Marin community. Located in Mill Valley, MaidPro offers its services in Belvedere, Tiburon, Corte Madera, Fairfax, Greenbrae, Larkspur, Mill Valley, Novato, Ross, San Anselmo, San Rafael, and Sausalito. We tried out MaidPro and had them clean our house, and they did an amazingly thorough job. Their pro cleaners did so much in the space of three hours—far more than I would have gotten accomplished in even double the time! I left them our house key and they came in and did their magic while I was out running some errands and the kids were at school. Best of all, they cleaned in places that we often forget or don't have time to clean with our busy schedules, like under appliances and furniture. It was such a great feeling to come home to a sparkling clean home! With busy schedules like ours, it was such a relief to have one less thing to worry about, especially with holiday gatherings coming up soon. We asked Cambria to answer a few questions about her background, her business, and what she loves about living and working in Marin. Please tell us about yourself. What's your background? I'm originally from the small, artsy town of Taos in northern New Mexico. I grew up skiing, eating delicious green chile and developing a fondness for all things Disney. That love for Disney led me to Florida, where I got my degree in business from the University of Florida and eventually a job at Walt Disney World. In the theme parks, I rose from working in attractions, to front desk, to club level concierge and eventually doing marketing for Disney's Fairy Tale Weddings. I found the love of my life, Sean, during my time at Disney. He was a teacher, loved the profession, and he led me away from Disney towards a career in education. Wanting a change of scenery, we packed our bags and took our teaching credentials to the great state of Hawaii, where we snorkeled, hiked, and taught for three magical years. Although it was a dream life, we were missing too many family events, so we headed back to the mainland to teach secondary math (me!) and special education (my husband) in the Bay Area. As two full-time teachers working and commuting in the Bay Area, we were very busy and often found ourselves reaching out for help with chores around the house. We found it difficult to arrange for cleaning, yard work, or repairs. In our experience, we had to book weeks out, they frequently cancelled on us, and the quality was low. That planted the seed in our mind, "we can do this, and do it better!" During college, I often found myself cleaning my dorm to avoid studying or writing papers. It was a peaceful escape and a wonderful, seemingly productive form of procrastination. So, the transition to owning a cleaning company came quite naturally. The demand for quality services in Marin is so high, and I had the Disney-trained customer service skills, cleaning experience, and teaching ability to effectively train and manage employees. In just two short years, we've grown to a team of 12, opened a beautiful office in Strawberry (come visit anytime! ), and are becoming a household name in Marin. How does your business work? What's it all about and how is it unique? The majority of our clients have us on a rotating schedule where we visit twice a week, once a week, every two weeks, or once a month. I like to think of this as putting your home on autopilot. It becomes one less thing you have to think about during your busy work week. Our employees, whom we refer to as PROs, come in like fairies, do their magic, and leave your home sparkling clean. We understand that everyone's preferences are different, so we're happy to customize a cleaning plan that fits your family's needs. We pride ourselves on communication, and we remind our staff of your specifics whether it's their first or hundredth time visiting your home. We are a full-service cleaning company, so you don't need to worry about paying taxes, insurance, workers' comp, or providing cleaning supplies or training—that's all on us. The only decision you have to make is what day works best! What's your favorite thing about your business and clients? Everyday, I get joy knowing that we are helping others manage their daily life; this is exactly what we were wanting when we were teaching full time! I view our service as not just providing a clean home, but we are giving our clients the gift of time. Time to spend watching their children grow, time spent taking care of their elderly mother, or perhaps it's simply just more time doing the things they love (and not scrubbing toilets!). Life is too short to miss those special moments. I also take great pride in providing family-friendly employment for our staff. We understand the importance of a work-life balance, so our PROs are happily home with their families in the evenings, weekends and on holidays. And we never deny a specially requested day off for them to take part in their child's piano recital, school field trip, or family gathering. Those moments build happiness, and who doesn't want to be surrounded by happy people everyday? What do you love about living and working in Marin? 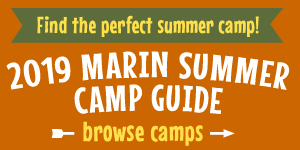 Marin has it all! The beauty of nature and the nearby city-life of San Francisco. It's a beautiful balance. We love to be outdoors; hiking, traveling, and exploring. Marin is also a great launching spot for nearby adventures. We are expecting our first child this April, and we can't wait to show her the beauty of the California shoreline, take her on a hike in Yosemite, and push her down the bunny hill at Lake Tahoe. We should all count our blessings daily that we get to live in such a special place. For more information about MaidPro or to schedule a cleaning for your home, call Cambria or Sean at (415) 524-2366 or visit www.maidpro.com/marin. Cucu's PlayHouse: Marin's Newest Spot for Music and Play!